Printable calendars that have 36 months on one sheet of paper. One printed page will have 36 months and, as you can imagine, the letters and numbers are small. 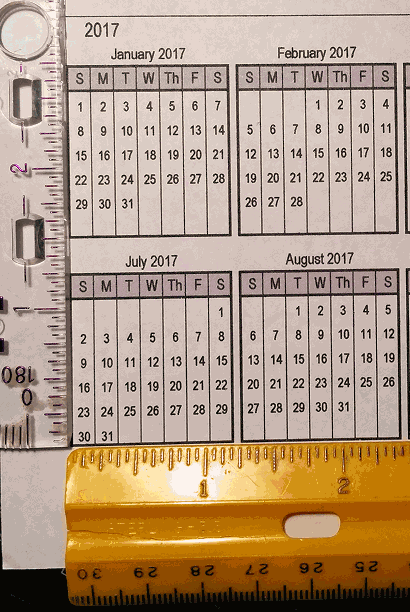 The numbers are around 2 mm tall and because I think that measurement is not helpful, I have included a photograph, below, of the calendar next to a ruler. 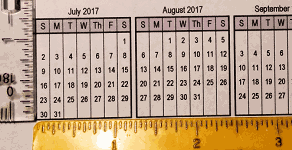 The 36-Month Calendar and a Ruler - The letters look blurry in the image, but they print clearly. You may view a larger version of this photograph by clicking on the image. AOP LifePac Electives Art Plan - Weeks 1-9, pages showing what we did.